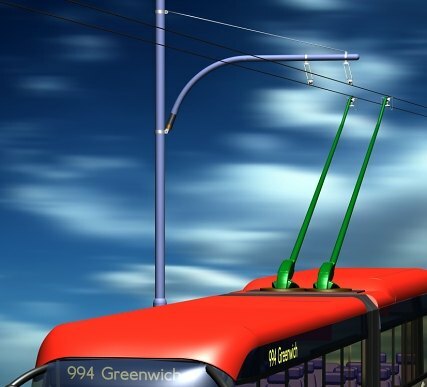 Because of the attractions of zero emissions and low running costs, Trolleybuses rely on electrical overhead contact systems. Much can be done to minimise what some see as visual intrusion, what others see as symbolic of clean air. Most agree overhead wires denote permanent, reliable service. Peter Price of Bradford offers newly developed overhead systems that use modern materials and that are flexible enough to minimise cost and visual mass. Michael Richter of ISR in Germany is developing an automatic trolley engagement system that holds the promise of eliminating points and crossovers, with considerable reduction in overhead costs and intrusion. downloadable here (22k pdf file). downloadable here (11k pdf file). Trolleybus overhead systems traditionally use insulation made of porcelain or composition with steel span wires, and metallic runner bars and cast bronze crossing work. Frog operation is by electric solenoid powered by contacts energised by the traction current, involving the driver in powering or coasting his bus to change route. The wires are 80 or 107mm2 spaced at 610/700mm. and powered at 600-750volts D.C. The Trolleybus collectors are of tapered or waisted steel tube encasing the copper conductors, with the performance in collecting current heavily dependent on the detail design of the carbon slipper collector and the flexibility of the steel tube. Contact force is spring applied, with retraction entirely manually, or by inertial reel systems in an emergency. Overhead line parts now often use grp insulation instead of the old composition, or synthetic parafil insulated rope instead of the steel wire, so eliminating separate insulators altogether. It is claimed that parafil rope looks better than the steel wire and separate insulator, but this is a subjective comment. The parafil rope has a larger size than the steel for the same strength, so that the parafl stands out more against the sky than the equivalent steel. Collectors have been fitted with air operated retraction systems which are relatively crude, and which merely overcome the pressure of the spring by the air cylinder. Collectors have been fitted with composite glass or carbon reinforced polyester tube to replace the steel tube; this can reduce weight and remove complex insulation bushes from top and bottom but the overall effect is usually to enlarge the tube diameter - the resulting collector design looks more bulky rather than less. Worse still, the lower flexibility of the composite tube usually means that a separate flexible mounting must be used as secondary suspension for the contact head. This further complicates the assembly. The outcome is a collector which weighs more.looks unsightly, and performs less well than the old flexible steel tubes. Whatever the materials used for the tube, there must be a copper wire running up - and of course there are still two such pole collectors on the roof of the bus. The logical development would be to incorporate the current-carrying members as structural members, for instance to make the poles of tapered aluminium and dispense with the bulky cables up the centre. This is a possibility Brecknell, Willis is actively pursuing at present. There have been attempts to devise a pantograph method of Trolleybus operation using split phase pantograph heads. Such a system is feasible, but it is arguably even less attractive than the twin pole collector, and there is complication in the requirement for the overhead wires to be kept level. What is needed is a minimum mass minimum visual intrusion collector. The Brecknell Willis concept is described later in this paper. We are set with the situation of twin copper wires side by side spaced at approximately 600-700mm. (This dimension is determined by being wide enough apart to prevent them blowing together and short circuiting in the wind, but close enough to be manageable in the streets.) Because a guided slipper used, the wires must be kept upright. The traditional system used a frame or crossbars to achieve this but careful use of overhead span wires can fulfil the same task. The Blackpool support system used extensively modern materials - investment cast stainless steel and aluminium bronze parts which were almost half the weights of the old designs. These have been supported on parafil cross spans or lightweight stainless steel span wires to register in position. 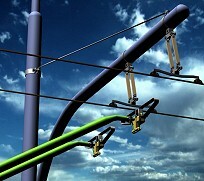 The lineside poles are reduced to the minimum possible diameter, and combined with street lights wherever possible. 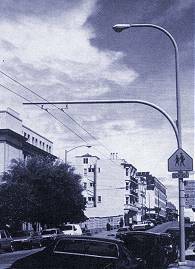 In certain areas, span wires from buildings may be possible and hence avoid poles altogether. The traditional system used cast brass or iron castings as pointwork in the sky. These are still available and used for most systems in the world. Their mass makes them unsightly and complicates the support structures, but at least the pointwork is condensed into a small area. Brecknell, Willis were involved in some developments of high-speed frogs in the 1950's and the result was pointwork capable of being traversed at up to 50mph but the result is a larger device in the air. Route changing is nowadays done by electric solenoids commanded by signalling circuits from the track or radio from the driver in his cab. Performance of the collector is heavily dependent on the mass of the collector head and the performance will affect the wear of overhead wire and fittings and hence maintenance costs of the system. Brecknell, Willis was involved in some work in the 1960's to reduce the mass of collector heads, and the trials showed that a simplified head could be produced reducing the mass from 8kg to near 4kg. 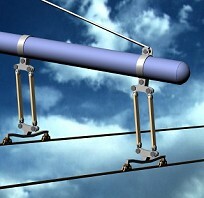 We are now using these ideas to produce an even lighter head which should follow the overhead wire smoothly. Given good overhead design, there is little reason for prolonging the use of two independent trolley collectors. We worked on the scheme for the Channel Tunnel electrification in 1958 and ran several locomotives successfully with a single arm type of collector on a Trolleybus-type of overhead. If the two poles can be combined into one, then mass is reduced. the loads on the overhead are reduced. and visually the appearance is improved. The result is a collector which looks more like a single arm pantograph than a traditional Trolleybus. The pole may be made of glass or carbon fibre. with the twin cables enclosed - this takes care of the insulation requirement sin one go and the material allows for a smooth transition of shape to make an aesthetically pleasing design The taper may also be used to gain just the right amount of flexibility to the pole, again giving good performance. The retraction system needs advancing to the state where the collector may be raised and engaged with the overhead without manual input. 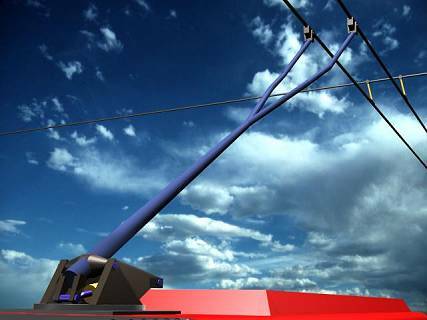 This is not possible with the twin pole arrangement without the use of chutes on the overhead - the single pole collector makes automatic engagement a possibility. The basic span wire is difficult to improve, There must be double insulation from street level by Board of Trade requirements. To achieve this there is always a choice between using the steel span wire (which may be stainless instead of the old galvanised wire) with its separate in-line insulators to provide the insulation levels. Or using a fully- insulated parafil rope which saves on insulators but is a bigger diameter than the equivalent steel for the same strength. It is arguable which has better impression (At Blackpool we used stainless steel with Separate insulators - at Midland Metro we are using parafil throughout.) Parafil gives more maintenance problems in terms of creep and life expectancy. The successful Trolleybus system of the future will be a well-thought out combination of the proven existing technology, with some development work on specific details. The major potential for the future is a new single pole collector to give technical and aesthetic improvements. By D.J.Hartland. MA CEng. ;MIEE. ;MImechE.